We don’t often come across a Kardashian/Jenner-approved product that’s actually attainable and affordable. The sisters usually rock custom-made ensembles and accessories that are way out of our price range. But recent photos of Kylie Jenner posing with her pup Norman show the reality star wearing an interesting new hair accessory that we can all copy right now. In the pictures, Jenner’s jet-black hair is adorned with a gilded hair tattoo and - get this - it only costs $4.99! The hair tat in question is scunci’s latest innovation. Just like skin tattoos, the temporary hair tats are applied with water and are easily removed with shampoo. They’re available in gold or silver and are a gorgeous option for upcoming holiday soirees. Wear a single strip like Jenner, or customize them to your liking. Each pack includes two sheets of designs, from chic paisley prints to metallic arrows. 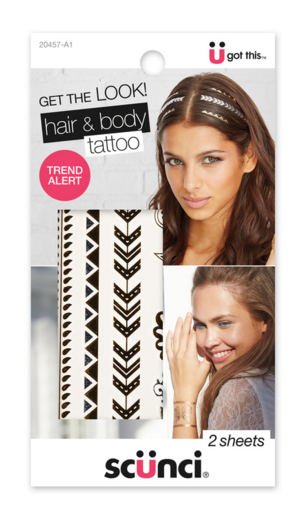 Get your scunci hair tattoos at Ulta and Target now.